Beavercreek senior fullback Austin Stevenson (46) reels off some yardage around the left side, Sept. 7 in a high school football game against host Fairborn. The visiting Beavers claimed their first win of the season, 57-19. Fairborn junior running back Gage Barron (7) tries to stiff arm Beavercreek junior outside linebacker Nicolai Seyler (17), during the first half of Friday’s high school football game at Fairborn Memorial Stadium. 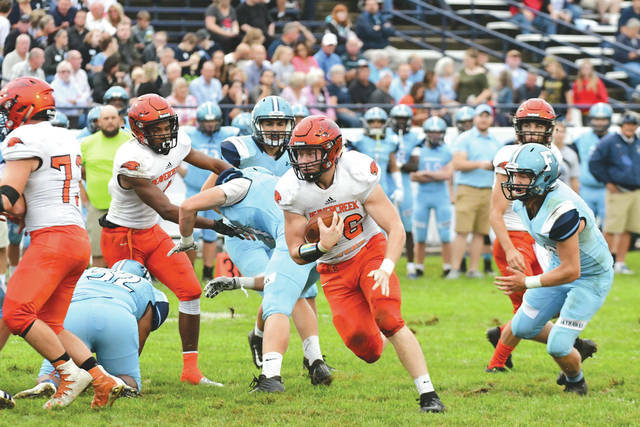 FAIRBORN — Beavercreek showed that defense and adjustments are just as much keys to winning as a good offense. 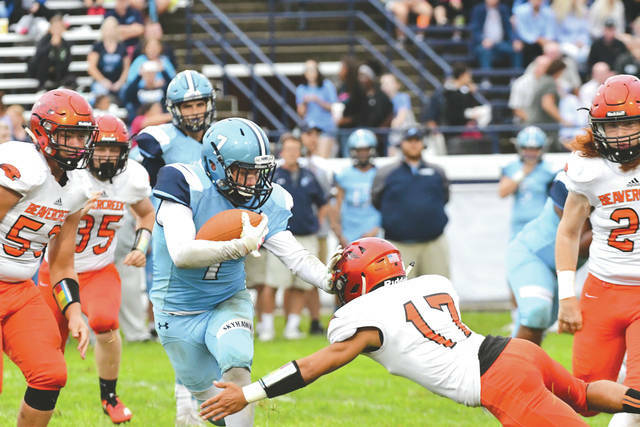 The Beavers picked up their first win of the season with a score of 57-19 over the Fairborn Skyhawks, Sept 9. Beavercreek’s offense was humming as they showed off their might early in the game. On the very first play from scrimmage, senior Sabastian Rendon ripped off a 49-yard TD. This was the first of many scores for the Beaver offense. Rendon led the Beavers in rushing with 125 yards and two TDs. Fairborn’s offense looked to be effective as well early on. They had a strong mix of rushing and passing and found some success in both areas. Garrison Secrest led the Fairborn offense with 143 passing yards and scrambled for 28 yards and a TD. In the first half offensively the Skyhawks did well, but they could not hold up on the defensive side of the ball. Beavercreek’s offense was only stopped one time during the first half. Beavercreek made some defensive adjustments at halftime and shut Fairborn out in the second half. Those adjustments paid off as Beavercreek’s defensive adjustments, mixed with an overpowering offense, led them to victory. Beavercreek will play its next game against Lebanon at 7 p.m., Friday, Sept 14 at James VanDeGrift Stadium. Fairborn will play its next game at 7 p.m., Friday, Sept 14 at Piqua.